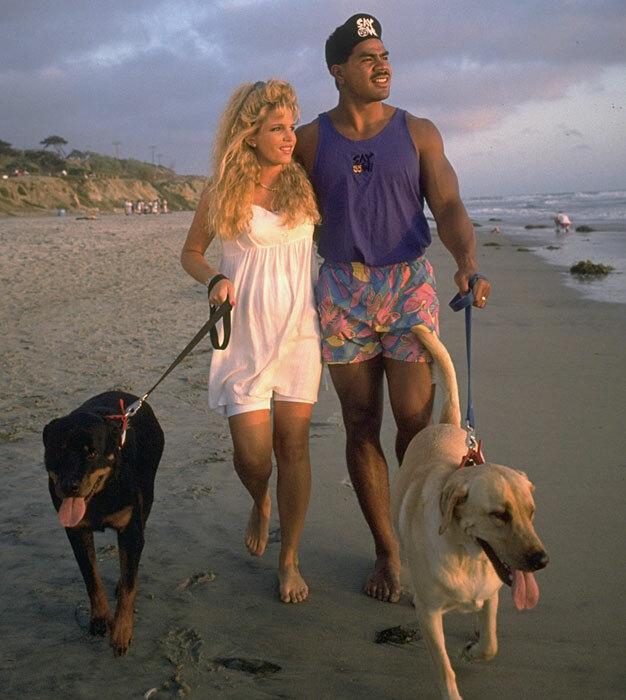 Everybody in San Diego has a Junior Seau story. That’s because this was his town and he gave back to everybody. Yesterday, a terrible day…talking to friends, checking facebook, twitter, etc… everybody has a story to tell. A good friend posted a picture on FB of him and his bride on their wedding day…with Junior. The man made an impact everywhere he went. Was he a perfect person? Of course not… nobody is. Sure, he got his pay checks from playing football… but he made a living out of bettering the lives of those around him. Junior, along with his then wife, Gina… used to go to my church. I’d stop and talk to Junior in the halls as often as I could without seeming like a stalker. I was 20 years old and mesmerized by his presence. I would try to look him in the eye, but I found myself drawn to one of his squirming, smiling kids he’d always be holding in his arms, or just his arms period… they were massive. We would run a fundraiser at church during the holidays… we’d sell Christmas trees and then deliver them to the houses of whoever bought them, all the proceeds going to youth mission projects. Junior didn’t buy one tree from us…he bought several, and I remember the high school and jr. high kids fighting to be the one allowed to ride along when we delivered to Junior Seau’s house. He was larger than life and everybody just wanted to be close to him. One struggles to find the good in a situation like this, so my hope and prayer is that this will raise awareness, not just for football players, but for everybody fighting internal demons, such as depression… Hopefully we as individuals will be more aware of those around us and their struggles… and if you’re struggling, hopefully this will motivate you to get some help, share with a friend. Prayers go out to Junior’s family…and the fans and community that loved him like family. This entry was posted in Football, NFL and tagged Chargers, junior seau, my junior seau story. Bookmark the permalink.